I had to wait until the 8th of the month for a photo adventure, heading to The Oval to see Linfield take on Glentoran. That was then followed up by a trip to Windsor Park the following Saturday to see Linfield take on Newry City. Another weekend, another football match, as I then headed to the Seaside to see Linfield take on Ards. The following weekend, began with Rugby, as I headed to Ravenhill to see Ulster take on Dragons. It was back to football the following day as I headed to Stangmore Park to see Linfield take on Dungannon Swifts. The month ended with a trip to The Odyssey to see U2 in concert. After a first defeat of the season against Ards last week, Linfield were hoping to bounce back as they travelled to a ground they had a good record at. Though, at lunchtime last Saturday, they had a good record at Clandeboye Park. Four goals and a win would have been great, but we all would happily have taken a 1-0 win. With Glenavon’s match kicking off at 5pm, this represented an opportunity to get some points on the board and put some pressure on the Lurgan side. Andrew Waterworth’s winning goal against Glentoran in the County Antrim Shield in midweek saw him restored to the starting eleven, while an injury to Josh Robinson in the same game presented Mark Stafford with his first League start of the season. The early minutes of the game saw a lot of Linfield pressure. There had to be. Recent games have shown that if you give opponents something to defend, the task suddenly becomes bigger. The closest they came to a goal when Andrew Waterworth flicked a corner goalwards, while Joel Cooper had a shot saved. Jamie Mulgrew also shot wide from a wide position, while Jimmy Callacher and Mark Stafford had headers go wide. It wasn’t all one way traffic, as Dungannon had shots of their own, with Paul McElroy firing over after the ball was pulled back, while Roy Carroll was forced into a double save later in the half. As the half looked to be coming to a goalless conclusion, Dungannon took the lead when a free-kick was headed goalwards by Douglas Wilson and it looped over Roy Carroll and in. Just like last week, Linfield’s opponents would have something to defend, and Linfield would have 45 minutes to turn it around. Whatever was said in the Linfield Dressing Room at half-time, it was short and to the point, with the players arriving out for the second-half well in advance of their opponents. The siege on Dungannon’s goal that Linfield fans were hoping for didn’t materialise. Linfield were forced into a substitution in the early minutes when Michael O’Connor came on for the injured Daniel Kearns. O’Connor for one of the wide players was a substitution we would have expected later in the game if Linfield were still chasing it. It wasn’t an ideal one to make in the early minutes of the second-half, but it could beworked to Linfield’s advantage. Within a few minutes, Linfield got that equaliser, when Joel Cooper started a counter-attack in his own half, playing in Niall Quinn with one pass. His cross looked like it was going to be headed home by Michael O’Connor, but it evaded him, but it hit a Dungannon player and went in. It was one of those horrible ones for the defender, where he couldn’t get his feet how he wanted them, and ended up putting the ball into his own net. It was a stroke of luck, but one that Linfield were more than willing to take. The goal came a lot earlier than the equaliser came against Ards last week, with Linfield looking to avoid a repeat of what happened afterwards. History almost repeated itself, as for the next five minutes, Linfield couldn’t get out of their own half, but thankfully were able to keep Dungannon out. The tide suddenly swung in Linfield’s favour when Seanan Clucas was sent-off for a second yellow card. Linfield couldn’t take advantage of it. Dungannon were holding out. Jordan Stewart came on for Kirk Millar as Linfield chased a winner. In fact, it was Dungannon who had the best attacking moment, with a Paul McElroy shot forcing Roy Carroll into a save, and Dungannon had a lot of the ball in Linfield’s half. It looked like being one of those days. Even though they would move level on points with Glenavon, it would be two points dropped, especially with Glenavon having two games in hand. As supporters would have been entering Mourneview Park for the 5pm kick-off, they would have been doing so with smiles on their faces at this scoreline. Suddenly, the smiles were on the faces of Linfield fans. 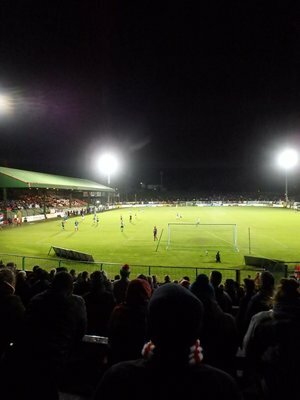 My view for the goal, well ……..
At grounds like Dungannon, I like to watch from one side for fifteen minutes, then when there is a break in play, go behind the goal, and then move to the other side. During a break in play, I planned to move to the stand along the side of the pitch for the final minutes. I realised it was a bit crowded and there was no view, so I moved back to where I was. As I turned back, the gate was closed, as they do for the final minutes. I turned around and saw the other gate being closed. There were a lot of Linfield supporters at the side of the pitch. Realising it was crowded with no view, they asked to be allowed to move back but this was refused. I found myself in a no man’s land, with a few other supporters, and we watched the game peacefully, until one of the security staff started to try and forcefully and aggressively push me out of the ground with seconds of injury time remaining. All this could have been avoided with some common sense. They should have closed one gate first, and not done both at the same time, or they could have delayed closing the gates and allow supporters to move back behind the goal so they could get a view of the game. Or they could have closed the gate earlier once it became obvious the area at the side of the pitch was filling up. There were a lot of angry supporters at being fenced in like this. Due to injuries during the game, there was always going to be a lot of time added on at the end. They could easily have delayed closing the gates and avoid people being stuck. All it took was common sense. It won’t stop me going to Dungannon, you never let people like that win. It seems to be a private firm that does their matches, and it’s not the first time away fans have had to put up with their dickish behaviour and attitude. The usual case of baboons with badges, trying to act the big man to compensate for their small dicks. The only thing that will stop me coming back to Dungannon in March will be if i’m travelling away to Northern Ireland’s Euro 2020 Qualifier that weekend. The goal, came from Mark Stafford, not that I saw much of it. Over the past few weeks, i’ve spoken of the importance of the squad. We’ve been operating on a core of 14 to 16 players in the opening weeks, and Stafford wasn’t one of them. He came in today, and won the game. He wasn’t brought into the team to score goals, but his contribution was greatly appreciated. Linfield held on and got the points. It wasn’t a classic game or performance, but it’s all about the three points. We just need to go back to basics. We haven’t kept a clean sheet in four games, it’s a bad habit to get into. We also need to cut out the “Hollywood Passes”. Sometimes they work, more often they don’t. The win sent Linfield top, though only for a few hours, as Glenavon defeated Newry City 2-0 in the 5pm kick-off. After the game, the draw for the County Antrim Shield Semi-Finals took place, with Linfield drawn away to Ballymena, meaning two trips there in the same week. I’ll be at Old Trafford that night, but I don’t usually bother with Shield games unless we reach the final, so hopefully i’ll get to go to a County Antrim Shield game this season. Tentative arrangements were made for Institute. 1pm kick-off has positives and negatives. I’ll wait to see what the final arrangements are and where we meet, as i’d like to head up early and make a day of it and try to do as much touristy stuff as I can cram into a morning. The ticketing arrangements should have been sorted by now. Any game that is all-ticket should be on sale four weeks in advance. It’s a basic courtesy to supporters. I’d imagine the tickets will be delivered when Institute visit Windsor Park on Tuesday. Thankfully, if they can’t get them on sale on Tuesday, we have two other Saturday home games between now and then for supporters to purchase. I understand cup games can be confirmed at short notice, but i’d like to see a four week rule in place for League games. It’s a basic courtesy towards supporters. We all have different lives, and we can’t all turn up at Windsor Park at short notice just to purchase tickets. Thankfully, the fixture schedulers have been kind in terms of ticket selling arrangements, giving us two to three home games. Hopefully, by the time we head Foyleside, we’ll have three home wins in the bag. One game at a time though. August’s football watching began at Wilgar Park to see Linfield take on Dundela in a friendly. The following day, was another Pre-Season Friendly, but in different surroundings, as Manchester United took on Sampdoria at Lansdowne Road. That weekend, I was in Edinburgh for the Edinburgh Festival. While there, I make an effort to attend a game, and I saw Edinburgh City v Montrose while I was there. 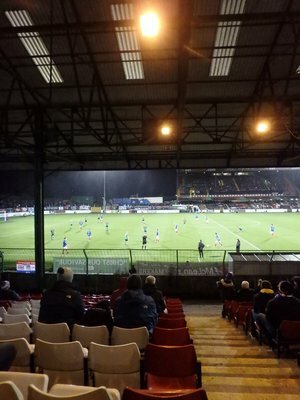 Upon my return, was the start of the Irish League season, and I was out for Linfield’s opening week of matches against Carrick, Ards and Dungannon. My football watching for the month ended by seeing Linfield take on Ballymena at Windsor Park. August began for me at Wilgar Park, seeing Linfield take on Dundela in a Friendly. The following night, was another Pre-Season Friendly, as I was on the road to see Manchester United take on Sampdoria at Lansdowne Road. That weekend, I was travelling some more, heading to Edinburgh for a weekend away, getting some Street Art photos and taking in Edinburgh City v Montrose. When I returned home, I was out getting some Street Art photos, the aftermath of Hit The East Festival in Eats Belfast. The following weekend, the Irish League season started, with Linfield taking on Carrick Rangers at Windsor Park, followed by a midweek trip to Ards and a trip to Dungannon Swifts. As soon as the final whistle blew at Stangmore Park, I was straight back to Belfast to see Amy MacDonald perform at Custom House Square. A few days later, I was back at Custom House Square to see Blossoms warm up for Kasabian, or so I thought, as Kasabian pulled out at the last minute. A few days after that, I was back at Custom House Square, to see Ocean Colour Scene in concert. The following day, I headed to Windsor Park to see Linfield take on Ballymena United. My photo adventures for August ended by getting snaps of murals of Jimmy Cricket, Jimmy Nesbitt, Jimmy Young and Carl Cox. 2017 began for me with a trip to Windsor Park to see Linfield lose 1-0 to Coleraine. Not the best start to the year. Things got a bit better the following Saturday when I headed to The Oval to see Linfield beat Glentoran in the Irish Cup after extra-time. It wasn’t all football in January, as I headed out to get photos of a George Michael mural which appeared in Botanic. Back to football, and I was on the road to Lurgan to see Linfield beat Glenavon 2-1. The following Saturday, it was back to Windsor Park to see Linfield beat Ballymena United 2-0. The next day, it was back to murals, as I headed out to get photos of a mural of Princess Leia that appeared in East Belfast, and then across Belfast to get pictures of a mural of Jon Snow. The guy from Game Of Thrones, not Channel 4 News. I then headed to Manchester for a few days, to see United take on Hull City. While there, I got some Street Art photos of Salford Quays. I headed over on 31st Janaury. You’ll have to wait for February’s round-up for the match and Street Art in Manchester. So, the 2016-2017 season is over for me. I hope you’ve enjoyed my photographic look back at the season just gone. I’ve selected some of my favourites, so feel free to vote for the one you like the best. Taken back in June 2016 at Northern Ireland v Poland, I like the composition, how everyone is fixated on the action at the other end of the pitch, and the colour co-ordination of both sets of fans. 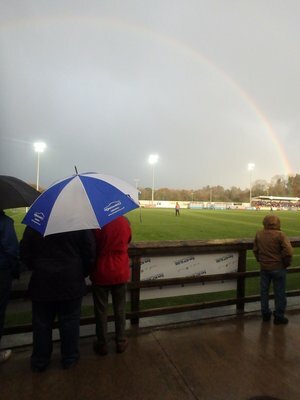 Taken at a pre-season game between Linfield and Dundela, it captures the joys of going to football matches in pre-season, sunshine and relaxation ahead of the hard slog ahead. I like the framing of this, as the crowd is in position, awaiting kick-off in a big match. Linfield fans celebrating Jimmy Callacher’s winner against Glentoran in October. I just like this for some reason other than the obvious. There’s just something about the architecture of old football grounds that does it for me. 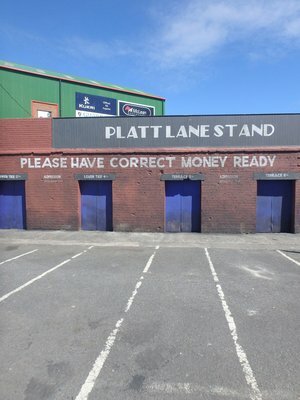 This is out of use turnstiles at Palmerston Park, home of Queen of the South. Linfield fans appeal in unison, all making the same hand gestures, for a goal to be allowed. The goal was disallowed for a foul. Taken at the Steel and Sons Cup Final. Some people like getting dressed up for Christmas. I like the composition of this, from Ross Gaynor’s posture, to substitutes chatting to each other while the game goes on. I like the composition of this, all eyes fixated on the penalty area and the incoming corner. I like the composition of this shot, it looks like a Spot The Ball image, except that the ball is in the shot, with two players getting ready for an aerial tussle. I love the framing and seeing players in the background running to join the celebrations. Celebrations after Andrew Waterworth’s second goal against Cliftonville, capturing the joy of the event and the achievement just about to happen. January began for me with a trip to Windsor Park to see Linfield take on Coleraine, a match which resulted in a disappointing 1-0 defeat for Linfield. It was then the Irish Cup for me, heading to The Oval to see Linfield get an extra-time win over Glentoran. The following Saturday, another away game for Linfield, this time to Glenavon, and another 2-1 win for Linfield. It was back to Windsor Park the following Saturday to see Linfield take on Ballymena United. My football watching for the month ended with a trip to Stangmore Park to see Linfield secure a 4-1 win against Dungannon Swifts.